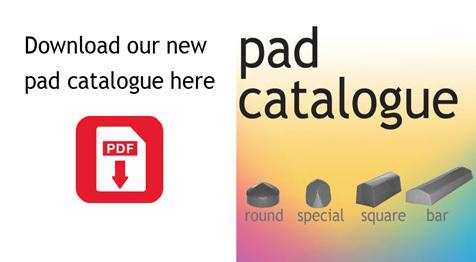 Our in house production of pads uses modern dispensing machines that ensure exact hardness and consistency. We only use the highest quality grade of silicone rubber that delivers the best print quality, durability and longevity. Choose from our huge range of shapes in three shore hardnesses. For some applications we design and supply pad matrix to ensure high quality print with minimum pad pressure on multiple areas of products. Our Click and Fix range with special pad adaptors enables pads to be changed without the removal of the pad holder from machines and without the use of screws. Print area: 65 mm dia. Base size: 110 mm dia. Print area: 50 mm dia. Print area: 30 mm dia. Base size: 60 mm dia. Print area: 60 mm dia. Base size: 95 mm dia. Print area: 10 mm dia. Base size: 20 mm dia. Base size: 96 mm dia. Print area: 85 mm dia. Base size: 127 mm dia. Print area: 55 mm dia. Base size: 107 mm dia. Print area: 32 mm dia. Print area: 25 mm dia. Base size: 50 mm dia. Print area: 80 mm dia. Base size: 150 mm dia. Base size: 65 mm dia. Print area: 76 mm dia. Print area: 26 mm dia. Print area: 37 mm dia. Base size: 70 mm dia. Print area: 35 mm dia. Print area: 45 mm dia. Print area: 52 mm dia. Base size: 76 mm dia. Print area: 13 mm dia. Base size: 40 mm dia. Print area: 20 mm dia. Print area: 27 mm dia. Print area: 36 mm dia. Print area: 11 mm dia. Base size: 25 mm dia. Base size: 82 mm dia. Base size: 87 mm dia. Base size: 46 mm dia. Base size: 58 mm dia.